This site answers the question: "What is a GMC motorhome?" Dedicated to owners where photos of work done on coaches and other things of interest are posted online by members. Below is an online article I literally stumbled upon while looking at the many motorhome images of the GMC accessible via the web. After reading you'll see why this one caught my eye. It's an admiring, non-owner's view of the bold approach GM took in creating the timeless design of the GMC motorhome. By the way, click on the Automotive Traveler banner to be taken to a fascinating site dedicated to covering all things unique, classic or exotic that are automotive. For much of the 20th century General Motors was the leading innovator in the design of the widest variety of transportation devices. Nowhere was this spirit of innovation more evident than the design, engineering, and marketing of the 1972 to 1978 GMC MotorHome program. Although I've never taken a vacation in a recreational vehicle, either a travel trailer or any class of motor home, I remain fascinated by all forms of portable hotel rooms. With my penchant for old cars, especially station wagons from 1969, I'm always looking for a vintage trailer small enough and light enough to be towed by my 1969 Rambler but big enough to have on on-board bathroom/shower. 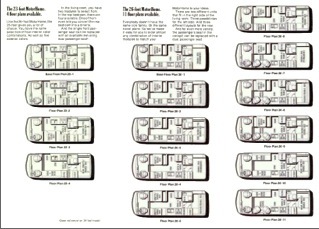 However, when discussing the most innovative motor home ever built, the leading candidate, in my opinion, is GMC's revolutionary 1973 to 1978 motorhome. Yes, I said GMC. Now I know what you're thinking; a motor home built on a GMC chassis, not a GMC-designed and manufactured motor home? But you would be just as wrong as I was. The 1973-1978 GMC front-wheel-drive powered motor homes remain the only motor homes manufactured by a major auto company. These motor homes were designed from scratch in-house at General Motors at a time that America's car company owned 50% of the domestic market and when no concept, no matter how outlandish it seemed at the time, was beyond its grasp. Designed to be a halo vehicle for the entire GMC line, it would leverage the design expertise GM had accrued in designing and building both trucks and commercial buses. Powered by a modified version of the Toronado's innovative big-block, front-wheel-drive drive train, it set standards for motor home design that have never been surpassed and which have engendered a cult-like following among motor home aficionados. I discovered these unique vehicles on the same knowledge quest while looking for background information for the Cadillac Eldorado, a feature I just produced for Classic American in the UK. Discovering the GMC MotorHome history has sparked a quest for more knowledge that already has me going in six different directions all at once. Unlike its contemporaries then as now built on a truck chassis supplied by one of the Detroit Three, the GMC team built a totally integrated package. 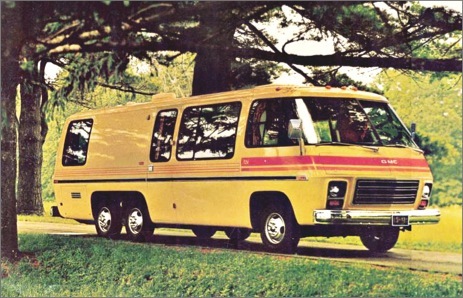 With all the drivetrain components mounted up front, the motorhomes by GMC had a flat floor 14 inches above the road combined with a very low step-in height, about the same as a contemporary truck-based body-on-frame SUV. 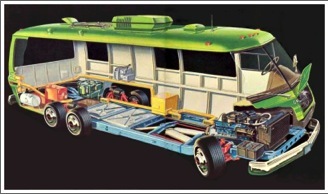 Like the Toronado and Eldorado, the GMC motorhome used the GM-designated Turbo-Hydromatic 425 automatic transmission. This marvel of packaging efficiency employed a wide chain drive to connect the output of the longitudinally oriented engine to the transmission. The final drive was connected directly to the transmission, and power was fed to the front wheels using half-shafts that ran under the front portion of the engine. To maintain the flat floor front-to-rear, GM's engineers eliminated any sort of traditional rear axle, substituting in its place an equally innovative rear suspension consisting of a tandem pair of wheels on each side mounted on bogies which rode on pins attached to the sides of the low-profile frame. The result was minimal intrusion into the cabin; with the exception of the wheel wells, the rear suspension does not intrude into the living space. A further innovation was the use of air bags for the suspension system, which gave the GMC MotorHome the benefit of an automatic leveling system that could adjust ride height as well as the ability to lower the cabin when parked at a campsite. In comparison to contemporary motor coach-based motor homes, the GMC motorhomes are exceptionally compact, measuring either 23 feet long on a 140-inch wheelbase or 26 feet long built on a 160-inch wheelbase. No matter what the length, all GMC motorhomes measure 96 inches wide and about 108 inches high, even accounting for the standard roof-mounted air conditioning unit. Inside the cabin, the floor-to-ceiling height measures 76 inches. The GMC motorhome deviated even more from its competitors in the area of body construction, which consisted of a rigid welded aluminum frame to save weight mounted on a traditional steel ladder frame using body isolators. The body itself was designed with weight reduction in mind throughout. With its expertise in molding complex panels for the Corvette, GM's designers specified lower body panels for the GMC motorhome constructed from molded fiberglass below the body's waistline. The upper side body and roof panels between the ends are sheet aluminum. Unlike traditional motor homes, which use wood for the framing of their bodies, there's very little to rot in a GMC motorhome, contributing to their unrivaled longevity, and all but the worst basket cases are candidates for restoration, especially when compared to the cost of a new motor coach-based motor home. The GMC motorhome had more in common with the construction of aircraft than the other recreational vehicles it competed against (think boxy, unaerodynamic Winnebagos). 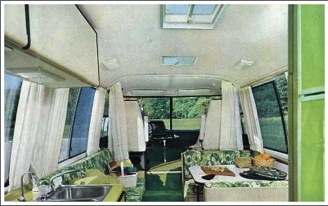 With the advanced construction methods employed in its construction, the GMC motorhomes benefited by the liberal use of large windows, giving the cabins a sense of openness that belied their compact dimensions. 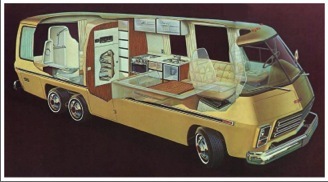 As the brochures from the era illustrate, there's nothing claustrophobic about a GMC motorhome. The interiors were bright and airy and were available in a myriad number of configurations and an unlimited number of trim combinations. So many of the GMC motorhomes have survived that many have updated and modernized interiors, but when you encounter one that has been restored in a period-correct motif, you will be amazed at how fresh and contemporary they remain. 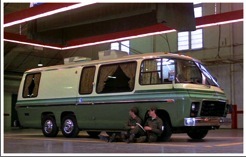 And yes, it was a converted GMC motorhome that became the EM-50 Urban Assault Vehicle that was immortalized in the 1981 Bill Murray blockbuster and comedy classic "Stripes." While I could go on and on about all the design and engineering innovations that the GMC motorhomes pioneered, it makes little sense to reinvent this particular wheel. So if you are as intrigued as I am about these revolutionary road-going Holiday Inns, I want to point you to the same place I discovered, an exceptionally well-written PDF that provides the whole GMC motorhome story far better than I can tell it in the limited space available here. It is truly an engrossing read. And then there's the equally excellent GMC Motorhome Enthusiast website where I was able to locate the brochure images for this feature. The website is absolutely compelling reading if you are interested in learning more about these technological marvels. With General Motors now teetering on the brink of a Chapter 11 filing, I find myself looking back more than ever at the highlights of its illustrious 101 year history, an era in which it played a leading role in the development of the American middle class while building hundreds of truly memorable vehicles. I started the process earlier this week with my feature on the 1967 Beaumont SD396 and am continuing the process in looking deeper into the development of these unique vehicles. They were conceived at a time when GM could marshal any of the resources necessary to build virtually any transportation device it desired. This same can-do attitude is exactly what's needed to revitalize GM in the years to come, especially with advanced technology vehicles like the plug-in hybrid Chevy Volt. To see this article in context, click on the link to be taken to its page at Automotive Traveler.